UPR's Billet 4.6L 2V Intake Spacer is a great way to add power and make that nitrous install easy. These new spacer has two pre-drilled and tapped ports that are perfect for nitrous nozzles or can also be used as a place to connect your boost gauge on supercharger or turbo applications. The unused ports can be closed up with the provided plugs. The Intake Spacer on Normally Aspirated cars has seen gains of 6-9 HP and anywhere from 14-23 on Supercharged applications. 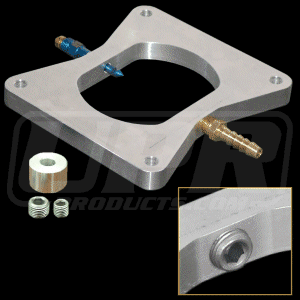 CNC Machined from 6061 Billet Aluminum and designed to fits between the lower intake and upper plenum. Two machined ports on either side of intake spacer. Installs in 1 hour or less. Nitrous nozzle and vacuum/boost gauge fitting are not included. 1996 1997 1998 1999 2000 2001 2002 2003 2004 4.6 2V V8 GT Mustang Steeda Roush & Saleen Vehicles. No one else can stack up to the bold clean styling of our aftermarket Billet dress ups, Street Strip & Racing Suspension & Performance Parts for your late model American Muscle Car!